My favorite place to practice the cello will always be the observatory. My friend Jamie, an astronomer, first let me in one day when the sun was up and visibility was nil. I practiced for hours under its high dome, right next to the telescope. The echo of music in the observatory was singular: less vibrant than a racquetball court, more round than a stadium stairwell, a fuller sound than I have found in any practice room on any campus I have ever attended. In the observatory, music swirled around, visited every surface and then came back to and through me to visit again. I didn’t want to practice anywhere else. Not only because I loved the sound, but also because I loved the short walk through the woods on my way in, the cool temperature, the old smell, the vibrations of the limestone walls, the look of the gray floor, and the small hole in the domed ceiling that sent every sound up into the sky. Jamie gave me a key so that I could practice in the observatory any time I wanted to, and on a cold spring afternoon nearing the middle of spring semester, when the days were getting longer and the trees were starting to put on leaves, I heard a faint sound playing along with me. I stopped to listen, and it stopped as well. When I started playing again, it returned. Every time I stopped, it did too, but even though my music covered the sound and kept me from hearing it clearly, I knew it was there, a faint pitchy whistle that, like the sound of footsteps in the woods, disappeared when I tried to get a closer listen. I had my junior recital the next week. Just me, my cello instructor, a small audience made up of close friends and family, and the observatory. At my request, the top of the dome was opened all the way so that my audience could look through the ceiling at the stars as they felt the music bounce around them before it made its way to the heavens. After the performance I walked home with Jamie. Always the gentleman, he offered to carry my cello, and I accepted gratefully although we made a laughable pair: me reaching a proud five-foot four with my three-inch heels on and him at a slouch still coming in at six-foot three, carrying a cello in one hand and a telescope in the other. He usually had a lot to say, but that night he was acting strange. “Wait,” he said. “You sounded great tonight, and I’m glad you like to play in the observatory, but…” He hesitated. “You heard it too?” I asked. Jamie and I went back the next night to try and take a closer listen. It was warm enough now that we didn’t need our jackets, and again he opened the dome so that we had a full view of the stars. “That’s my favorite one,” I said, pointing to a bright star in the east. “Your favorite planet?” he asked. I felt suddenly embarrassed. “Is it a planet? I thought it was a star,” I admitted. 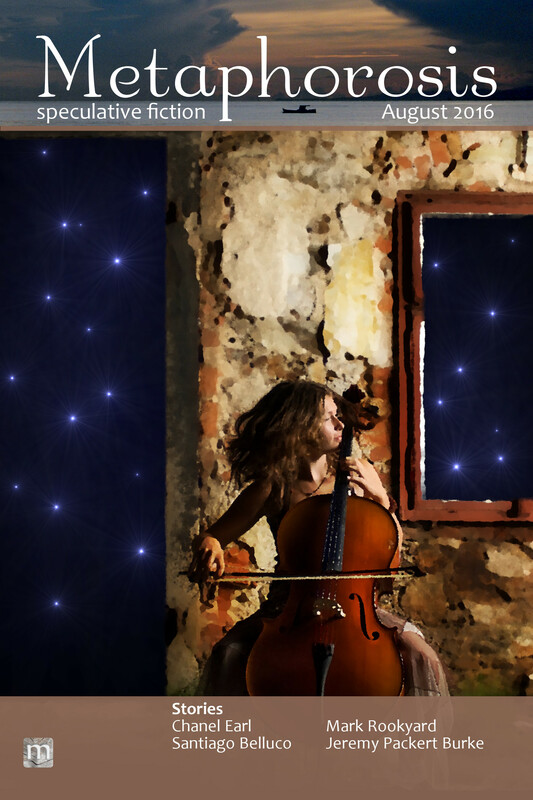 I admitted that I had only noticed it a few weeks ago, and realized as I took my cello out and tuned up, that I didn’t really know much about astronomy at all. We decided it would be best if I played the same songs I had performed at my recital. Then, while I played, Jamie moved around the room looking for vibrating panels and listening for anything that could explain the sound we had both heard. He paid careful attention to how the vibrations interacted with the telescope, and at one point, in the middle of a song, he asked me to stop and just play the same note for about five solid minutes as he stared at a meteorite that was sitting in the corner. As we experimented, we learned to hear the music more clearly. It was certainly not imaginary. Soon, we were meeting every night to experiment with the sound, and we did learn more about it. For example, it didn’t seem to matter if I played in rhythm or in tune, loud or soft, fast or slow. We could hear it when I played with the dome closed and open. After a week or two of listening we started to hear it with every note. It seemed to come out of the sky and enter into us, a throaty whisper of song, like the echo of a bird through a desert canyon. We made recordings with our phones, trying to capture the sound we were chasing, but they were useless. We tried manipulating them to isolate the new sound, but it doesn’t work that way in real life—just in the movies. The sound was faintly there only because we knew what we were listening for. In spite of our investigative efforts we were no closer to finding out where the music was coming from than we were the first night we heard it. I was, however, learning a lot about astronomy. After I learned how to recognize Venus, Jamie moved on to other planets, then major constellations. We even spent a few days looking at planets and galaxies through the telescope. “Yeah,” I said absentmindedly as I played, “That’s a great idea.” I finished my piece, which was “The Swan” by Camille Saint-Saëns, and even though I didn’t have a pianist to accompany me, the observatory provided its own accompaniment, which sounded like no instrument I had ever heard, but called to mind the trickle of a mountain stream. It didn’t completely register that we were going to go stargazing the next night, so when I showed up at my usual practice time to find Jamie waiting outside with his backpack still on, I needed an explanation. “We’re heading out to see some real stars.” He said as if it were enough. “I have my cello with me,” I said, “I’ll have to take it home.” I had wanted to practice and tried to sound as disappointed as possible. “There’s room in my car,” he said, not letting me get out of going. He reached out to take it from me. “A star party,” he said with excitement. And it was exciting. I learned on the drive that some of the astronomy faculty and their students, Jamie included, held parties like this every month, but to me, the whole idea was new and exotic. We had to drive over an hour to get far enough from the city, and then Jamie turned onto a dirt road that led through the woods. The long drive reminded me of the walk I took to the observatory every night, but it was more wild and unpredictable. Instead of a paved walkway through a manicured campus forest, I was driving through miles and miles of real wilderness. Sure squirrels lived in both places, but I guessed that there was far more, and far larger wildlife here. Jamie drove up a hill to where the forest opened into a sort of grassy field, and we got out. By now the semester was almost over and summer was on its way. The forest was filled with newly green trees, casting their young shadows even in the starlight. The smell of fresh earth was everywhere, as were the sounds of frogs croaking. When we got to the star party, I looked up at the sky and almost fell over. My whole life I had heard about the Milky Way, but I had never understood it. I had also always wondered why people would talk about the “infinite” stars in the sky, when it seemed like every time I looked up I could only see maybe fifty stars, maybe a few more. Away from the city, without all of the streetlamps and headlights, I saw more stars than I had ever seen before. An ocean of stars filled the sky, with a white current running from north to south. It seemed like millions of stars were visible. Most of the telescopes were already set up and pointed at various planets, galaxies and nebulae, but I had no desire to look through them, not when there was so much to see already. I had wanted to practice, and seeing the stars was so inspiring I decided I might as well go ahead right here. Jamie said that was a great idea, and helped me get up the courage to do it with so many strangers around. I was used to practicing under the stars, but this was different, there were so many more stars and they were so bright. I started with Bach’s Cello Suite No. 1, which people almost always love, and even usually recognize. Almost immediately, I heard a familiar sound playing along with me. Up until now, I had assumed the accompaniment I had heard in the observatory was unique to that place, but here I was at a star party, bowing under the Milky Way, and there it was, my mysterious accompaniment. What had begun as a faint whistle shortly before my recital had transformed into a full, rich roar, at times like rain hitting the surface of a lake, at other times like the ringing of church bells. I could imagine the stars ringing every time I saw one twinkle, and it was beautiful to hear the music of the stars playing along with me. Jamie heard it too. He was used to it by now, so when he heard it on the hilltop he couldn’t help but smile, and as I finished the first piece, I saw him look up at the stars in awe. A few of his astronomy friends also heard something, but I could tell it wasn’t as clear in their unfamiliar ears, and I’m sure it was easy to explain away as the rustling of the wind or the howl of a distant coyote. After I finished a few more pieces we headed home. I didn’t know what to say, and he didn’t either. We talked about the music, the astronomy, the similarities between the observatory and the hilltop, everything but the inconceivable idea that a shooting star might fall in time with my cello playing. That night, I had trouble sleeping. Around four in the morning it started raining and the sounds of the rain tapping the window finally seemed to quiet my thoughts. I turned my pillow over to the cool side and realized I was wearing a space suit, floating in darkness. Stars appeared in the distance, and when I looked down saw that I was holding my cello. I began to play, but the music didn’t sound right. I continued anyway, now worried that I was messing up the entire performance, but when I finished and stood up to take a bow—no space suite, only me in the observatory—the audience gave me a standing ovation. I woke up wanting nothing more than to play in the observatory as soon as possible. Soon after that, Jamie and I went from curious to obsessed. He started calling it “The Sounds of Space,” and took every opportunity to sit in on my practice sessions, which I still held in the observatory almost every night. He mostly worked on his dissertation, but I would catch him closing his eyes and just listening more often than he would like to admit. Our experiments took a back seat, but we were still learning to listen better every day, and after a while we realized that it didn’t seem to matter when I played, day, night, it was all the same. Jamie pointed out that the stars were out all the time, even if the sunlight was so bright we couldn’t see them during the day. I enjoyed practicing more than ever, and not only because I had an audience around, but also because the music I was making seemed better than usual. It was like I had extra help, and the longer I played with the new sounds, the more I learned to hear them. They became so much a part of the music that whenever I played with my ensembles it sounded hollow. Then one night, as I was finishing up my last piece, I had a new idea. “Have you ever wanted to go to space?” I asked Jamie after the last note echoed through the dome. “I’ll see if I can find a way,” Jamie said. It felt like a promise. It seemed absurd, but once the idea was in our heads we couldn’t let it go. I looked up details about NASA and what it would take to become an astronaut. Jamie requested information from everyone he knew who had connections to the handful of private companies that were sending individuals to space, either into sub-orbit, orbit, or to make a lunar landing. We even tried to win an orbital vacation in an Internet contest, but with negligible odds, it wasn’t surprising that we lost. We both decided to stay on campus during the summer semester, but with no classes to take, we spent most of our time working on the problem of getting me to space. I did some research on what would happen to me and my instrument if I ever did make it into space, and realized that there would be serious problems playing the cello in zero gravity. My cello would out-gas. My bow would float away. I would need twice my usual strength to even hold the instrument correctly. I knew it was crazy, but just in case I ever made it, I had my cello treated and started an intense workout program. Jamie was shameless. After exhausting every personal connection he had made in grad school about how to get me into space, he began emailing and phoning strangers. His single-minded optimism that I would get out to space made it seem not only possible, but inevitable. We just couldn’t give up. At the beginning of my senior year I found myself more interested in observatory practice than in pretty much anything else. I moved through the year with one goal in mind, barely completing my graduation requirements, and completely forgetting to apply for grad school, even as my professors reminded me every day. Then it happened, shortly before graduation, and over a year after my junior recital. I was thrilled, ecstatic. I could hardly practice because I was shaking so hard, and Jamie kept giggling like a teenage girl. Finally I calmed down and forced myself to practice; as I did a new energy animated the music. Jamie closed his eyes and listened to the sounds responding. But, as always, when I stopped playing, all was silent. On our walk home, reality set in and I started worrying, “Did you tell them why we really want to go?” I asked. I shot him my best glare. Leading up to the concert, I played more than ever. We probably spent twelve hours a day in the observatory, having to work around the scheduled tours and classes that were held there. Jamie recorded nearly every practice session for review later, and I memorized every piece, not just my part, but the sounds playing along with me. Jamie also gave me more astronomy lessons. We looked through the telescope at satellites as they drifted by. We talked about how different the stars would look outside of the atmosphere, how they wouldn’t twinkle, how their colors would be more clear. By the time we took off, we felt more than ready for the trip. We weren’t. My black flight suit was specially designed to allow for the movement required. My seat was rigged with Velcro and welded to the floor so that I wouldn’t float away. But even with all of the preparations, during my first rehearsal, my arms struggled to keep the cello at the correct angle without gravity helping out, and, worst of all, the sound was dead. Space was quiet—so quiet. I glanced out of the small round window at the earth—not under my feet, but miles away, shining. It was blue and white and green and alive, but space was black. I was cold. Jamie and I were both feeling sick. We still recorded the concert as promised. I played in cramped quarters with terrible acoustics, Jamie pressed the right buttons at the right times to record both audio and video as required. The filmmakers had their work cut out for them mixing the sound and editing the video to make it interesting, but even though the spacecraft was acoustically sterile, I played well, and the program was beautiful. I did my best to hide my disappointment in the experience, pretending to be energetic and excited and as I floated around in the dead capsule. By all public measures, the event was a success. I started to receive invitations to play all over the world. Even though I had missed the application deadlines for grad school, I learned that my video was being counted as an audition and it wasn’t to late to get in. Someone referred to me as “The Celestial Cellist,” and it stuck. The press conference we promised to attend lasted six hours. But privately, Jamie and I knew the trip was a failure. We hadn’t learned anything about our mysterious sound. We heard nothing, saw nothing, felt nothing. The music I made was, by our new standards, cheap and hollow, like a tin flute. We were used to hearing something more like a symphony orchestra—ocean waves and a flock of starlings every time I played. As soon as possible, we returned to the observatory. The short walk through the immaculate woods was like a walk home, and as we ascended the limestone steps into the dome itself I was overcome with emotion. I had traveled to space, and now here I was back where it all started, and I didn’t know anything more than I knew at the beginning. I began to play and was immediately joined by an unmistakable chorus. I suddenly realized I had been holding my breath. Tension that I had been enduring since I was in orbit started to leave me as I relaxed into the music. But now, as familiar as they were, the sounds were also new, changed—or I was changed. I had been to space. Had heard the sounds the stars had to offer, and these were different. They were dense and intimate and alive. The sound, trapped between walls of limestone and steel, vibrated through the air and then came back enriched. It was beautiful. I saw the look of joy on Jamie’s face and knew I was seeing a reflection of my own. For the first time, we recognized the music for what it was: the sounds of the earth. It was thunderous waves crashing against a cliff side, a family of cicada’s—millions strong, wolves howling, roots and branches stretching through dirt and sky, wind roaring and whispering and carrying the sounds of the seasons. The music rang the chime of eons, of life dancing with and death buried under the stone. It came through the bottom of my feet and left through my hands only to bounce out and up and through the open ceiling, where—I laughed—we could still catch a glimpse of the stars.